I call my house the Secret Laboratory. It isn't located in the caldera of a volcano. I don't have a moat stocked with robotic, attack-trained sharks. In fact, it isn't a laboratory at all. It's the fixer-upper of a house that I came to thirteen years ago and where I've produced all of my illustrated books, from Celtic Knotwork Borders in Repeating Sections through The Lair of the Clockwork Book and Slaves of the Switchboard of Doom, to (most recently) Patently Absurd. The Secret Laboratory is also the place where I created the often-popular Pulp-O-Mizer. You can see Google Maps' old photo of the house up above. They don't come around here very often, so it's not a recent picture. Ten years ago, at a time when I had no health insurance, I was diagnosed with cancer. After months of treatment and surgery I found myself cancer-free... but I was left with a stack of bills that first wiped me out and then sapped away any money I was able to earn through my work. That led to a cycle of debt that finally exploded last year when I found myself unable to keep up the payments. It's a long story that I've told elsewhere . My work on the house came to a stop when I got sick: so my fixer-upper hasn't seen much fixing up since then. And now my insurance company has told me they won't renew my homeowner's insurance in April unless I replace the house's old slate roof in addition to its porch roof, which is sadly decrepit. If I lose the homeowner's insurance, my mortgage lender will foreclose. Now, the reason this house made such good sense for me is that its mortgage payment is far lower than any rent I might pay for a place to live. I can afford to live here; I can't afford to live anyplace else. The only reputable estimate I have for the house and porch roofs is pretty high, at $11,300. I say “only reputable” because I've talked to the other kind of contractor too; if you own a house you probably know what I mean, and why I'd rather stick with the roofers I can trust. But it's a large chunk of money in my situation, or in anybody's. I'm exploring several types of loans, but because of my credit crash last year it's pretty unlikely that I'll find a lender who'll deal with me. And while there are government programs that might be of help they're very slow and some aren't available because of the government shut-down. So as the clock ticks toward April I'm appealing to anyone who chooses to help. This is especially frustrating because in about a year I'll be eligible for Social Security. The way I see it, if I can make it to March of 2020 my life will get very much easier... provided I still have my house. It's just so hard to see how I can keep it. And that's the reason why I'm here. The bid for the house roof is $7600. That's a bit higher than a simple re-roofing over asphalt shingles: the original, 100 year old slate roof has to be removed before the modern flashing and asphalt shingles can go on. The porch roof is in very sad shape, with three holes you could drop a goat through, if you had one. I patched the worst of those last Fall and also rebuilt the center section of the porch. The bid for removing the old roof, replacing some of the framing, and then building it anew is $3700. I've added $500 here to cover GoFundMe's processing fees. If you contribute enough to complete all the work, well, that would be fantastic. What a wonderful bunch of people you are! But if we're only partly successful here I may be able to supplement these funds with some other kind of funding, or find another way to make it work, to keep my house, and to survive. 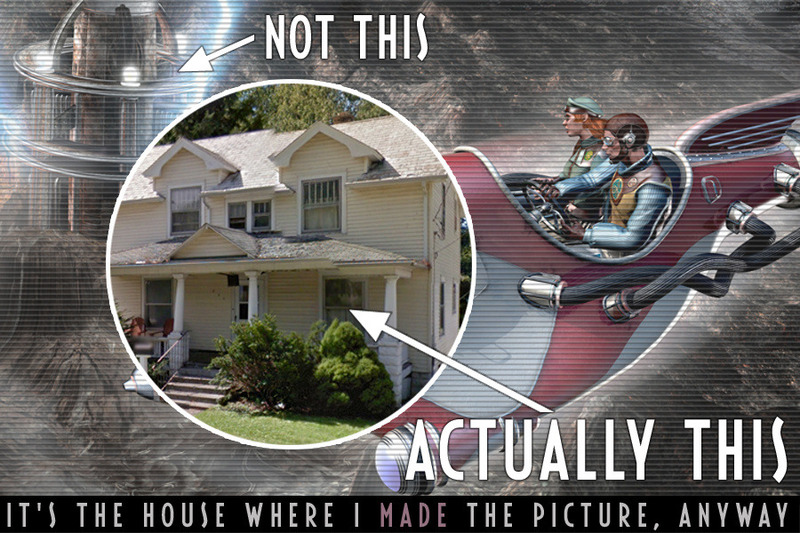 This house was a great idea for me thirteen years ago. I came to a part of the country where the cost of living is low, and I planned pretty carefully a way to survive on a small income, which is the kind of income I expected to have once I quit the day job to rely completely on the income from my creative work. It wasn't a bad plan. It was actually a pretty good plan. But it blew up in my face when medical bills ate up everything I had. For the past ten years I've lived month-to-month in a white-knuckled marathon, hanging on until I'm eligible for Social Security. I've nearly made it. But if I lose my house I can't see any way I can make to to the finish line. I've run successful Kickstarter projects, and felt pretty good about delivering interesting things to people who want to see them. But I haven't ever done something like this: to ask strangers to simply give me money because I can't make it on my own. I hate that. But my situation is extreme, right now, and so I'm doing it anyway. So if it's possible for you to help that would mean a lot, and maybe everything, to me. But I understand if it's just not something you can do. So with a loan from a very generous donor, I've been able to pay the roofers a deposit for the roofing project. It's looking like things will work out on time. That loan has made up the shortfall here; but because it *is* a loan, and I'll need to repay it, I'm leaving this GoFundMe page live for the time being. Thanks to all who've contributed! Thanks very, very much to everyone who's contributed! I've received a check I was waiting for, and after paying my property tax I figure I have about $1000 left over: so together with your donations I'm about 1/3 of the way to hanging on to my house. I can't even think of any other response to that better than "Thank you!" But the bad news: if I'm not able to call the roofers by the beginning of March I'll be right back where I was when thus started. So please spread the word. Although I've had three donations of $500 the rest has come from smaller amounts. Smaller amounts rule. Bigger amounts, of course, also rule. Maybe they rule a little bit more.